Revolutionary technology offering the most advanced table tennis ball on the market. The next generation of table tennis balls has finally arrived. 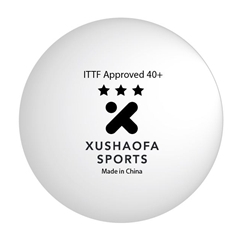 Introducing the Xushaofa Seamless Poly 3-Star Ball, offering the most durable and consistently accurate product on the market. Approved by the ITTF and USATT for international and domestic competitions. With our innovative construction process, we offer an entirely seamless table tennis ball, permitting the most consistent bounce and accurate performance to date. Unlike traditional celluloid balls, which are no longer used for competition play, our poly plastic material is more durable and long-lasting. Furthermore, whereas celluloid is highly flammable and often dangerous to manufacture, our poly plastic is produced safely and in accordance with responsible manufacturing guidelines. Our ball is suitable for players at all levels for both recreational and competition play.